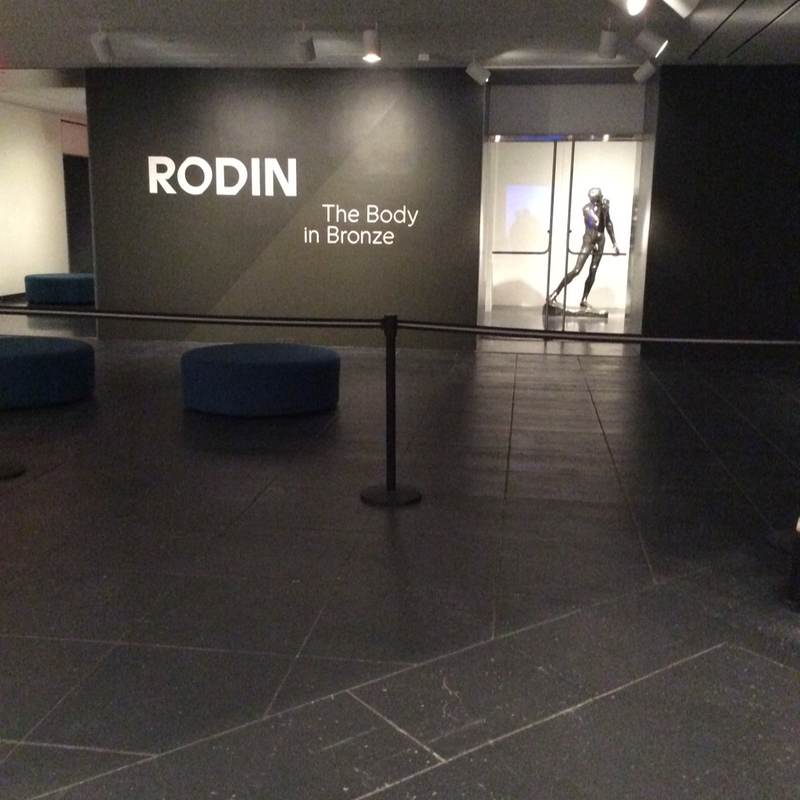 I'm very interested in the upcoming Rodin show. 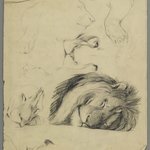 Can you tell me a little bit about the exhibition? This is the 100th anniversary of Rodin's death. 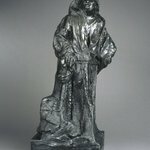 The museum has an impressive collection of Rodin sculptures donated by "Bernie" and Iris Cantor. Mrs. Cantor grew up in Brooklyn and visited the museum as a child. 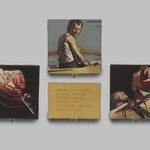 The show includes works from different points in his career, from early and fairly conventional portraits to some of his most controversial monuments. Also included are ancient fragments from our permanent collected that represent the type of art that Rodin collected and looked to for inspiration. Ohhh controversy! 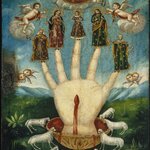 Can you tell me a little bit more about those controversial works? Rodin's figures are not idealized in the way that was expected for an honorific monument. For example, Honoré de Balzac is shown in a house robe, with wild messy hair. Also, Rodin often did not "complete" his work in the traditional sense. The surface texture was rough and sometimes a body was missing limbs (this is an idea he got from ancient fragments). Many of his proposed public works were either rejected by the committee or were scorned by critics. 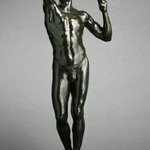 Did Rodin enjoy a lot of success during his lifetime? Yes! 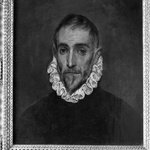 Despite the controversy, he was one of the most famous artists of his day. 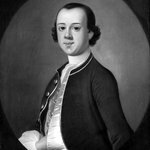 He had dozens of studio assistants and hobnobbed with the rich and famous. I see that Rodin made multiple versions of works. Was this to lead up to and practice for the final piece? It depends on the work you're looking at. 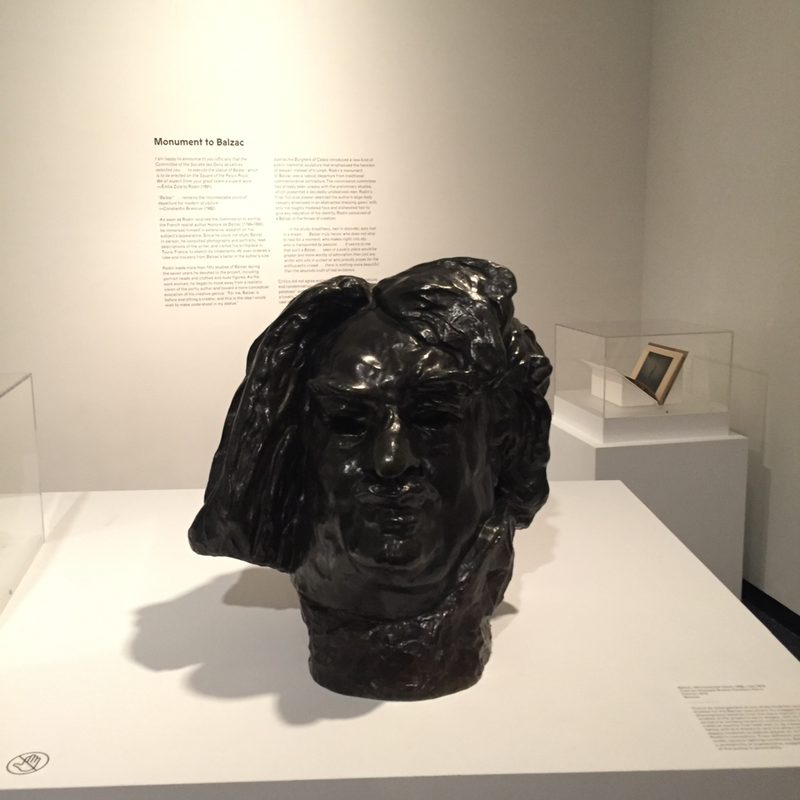 For instance, we have several works in the exhibition that were in preparation for the monument to Balzac. 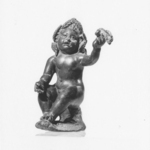 In other cases, multiples have been cast in bronze from a mold of the original sculpture. Yes! A lot of work went into making the models and molds, but once made they could be efficiently replicated. But I see that the number is limited to 12—is that still the case? Yes. 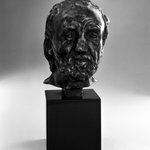 The restrictions on the number of multiples weren't established during Rodin's lifetime but in the 1950s production was limited, with the caveat that the works produced were considered "the artist's handiwork" and were therefore original, despite his death. Basically, the limit to 12 casts preserves the integrity of Rodin's original work while allowing his body of work to grow after his death. I agree. 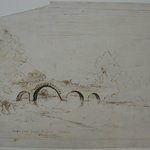 You don't often hear of artists producing more work after they've died! 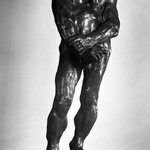 What makes Rodin so significant? 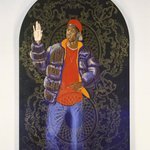 Why is so much of his work in NYC lately? 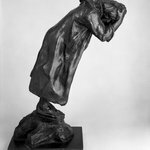 To answer your second question first, it is the 100th anniversary of Rodin's death and several organizations have arranged to exhibit his work at the same time to commemorate him. 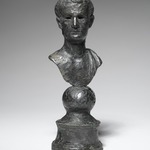 Also, B. Gerald Cantor was the single most important collector of Rodin's work. He left many pieces by Rodin to New York museums. You're welcome! Rodin is considered very significant because he is seen as a crucial link between traditional and modern art. 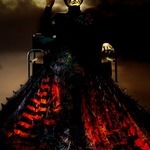 He was not interested in idealized, perfect sculpture, but instead tried to make work that was emotionally expressive. You may have heard this before, but many consider Rodin to be "the greatest sculptor since Michelangelo". However, it's fair to say he has had his share of critics! Wow! Yeah, I was at the Rodin Museum not long ago. It's amazing how much work this guy produced. 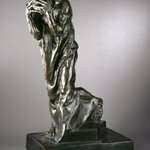 How did Rodin create these works? After Rodin made the clay models, a studio assistant would form plaster molds around them. The clay would then be removed from the mold, which would be taken to a bronze foundry. There, molten bronzes could be cast in multiples. 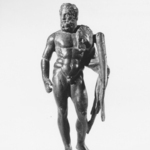 The bronze, once it cooled and hardened, would be given a chemical patina (surface treatment). 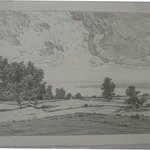 He was a prolific draughtsman! 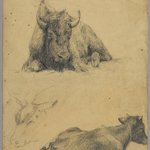 He produced over 10,000 drawings. 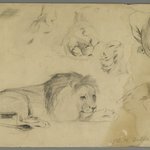 His drawings are rarely exhibited because they are so fragile. Most of them are figurative, like his sculpture. Ah okay, that makes sense. They are probably really cool. Figurative drawing captures body movement so well. 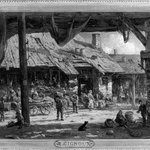 I have a very stupid question: what was really going on in France in the late 19th and early 20th centuries? How did a society produce people like Rodin, Monet and genuinely reboot art? It wasn’t all the Franco-Prussian war, was it? France, like other European nations, was experiencing enormous changes in the late 19th century; increased industrialization caused major changes to class structures. 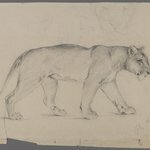 The Franco-Prussian War did have a devastating impact on the French psyche, which is something that artists like Rodin picked up on in their work. The war affected the way that the French viewed women. At this time there was the idea that the role of women was to have more French babies, to increase the population and swell the ranks of the army. 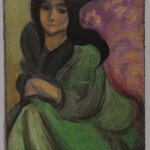 This is reflected in the heightened sensuality in art depicting women in this period. 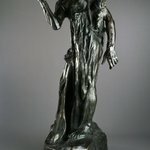 Is there a connection between Rodin and Michelangelo? Yes, at the height of his career, Auguste Rodin was regarded as the greatest sculptor since Michelangelo. 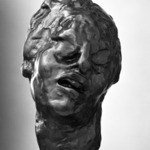 This was the ultimate compliment to Rodin who revered the work of the great Italian master! 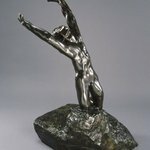 Is the law of 12 casts in France only for Rodin or for any sculptor? To my knowledge, it is used to control posthumous casts of Rodin's sculptures. When Rodin died, he left his estate to France, which is how the country is able to control the number of casts produced. Sculptors whose estates do not belong to the state are not subject to these restrictions. 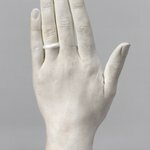 Did Rodin do any hand sculpting work - or only chisel? 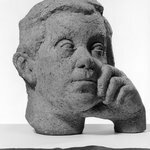 He did both actually—hand molding for the clay models used to create his bronze sculptures and chisel for his marble sculptures. 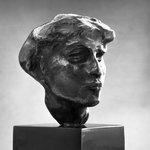 His wife said this of Rodin's process: "his method was unlike that of any other sculptor I have had the opportunity of watching. He first made flat surfaces in the rough lump, and then added little pellets of clay which he rolled between his fingers while he talked. He worked by adding to the lump instead of subtracting from it. As soon as we left he smoothed it all down and next day added more. 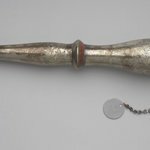 I scarcely ever saw him with a tool in his hand." 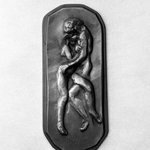 How did Rilke and Rodin meet? 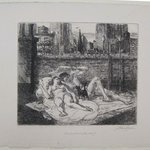 They first met outside of Paris in 1902 when Rilke took on a project as an art critic to write a German monograph on Auguste Rodin who was 61 at the time. 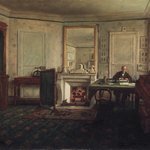 Was he already writing poetry? 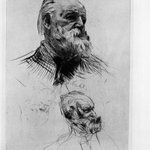 Yes, he was already writing poetry at that time but his observations of and conversations with Rodin helped him discover how to be a better poet. Most of the Rodins I'm seeing here were cast in the sixties and seventies. Who keeps and owns the molds and determines how many more bronze series can be done? I heard that sometimes the mold is broken by the artist after the bronze series is done. That is a great question and something that many visitors wonder about. 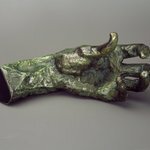 Rodin was a very commercially-minded artist and during his lifetime, he did not limit the number of casts made of each work. After his death, he left his molds and artwork still in his possession to the French government who set laws about how many copies could be cast. How can we say Rodin is a bronze sculptor if he didn’t cast his own bronzes? I would venture that we say Rodin is a sculptor, perhaps most famous for his bronzes. 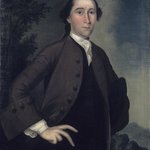 Although he didn't cast the work in bronze, he created the clay model and oversaw the creation of the plaster mold that would go on to become the bronze cast. 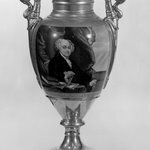 He would be considered the sculptor and the artist, whereas the foundry is the manufacturer. As the artist and designer, he always intended these works to be executed in bronze. 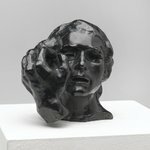 What does “cast by” mean in the Rodin exhibition? Great question! Rodin never made the bronze versions (casts) of his sculptures. He paid specialized bronze workshops (foundries) to do that for him. 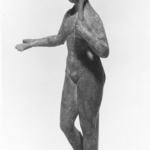 The "cast by" indicates which foundry made the bronze sculpture. 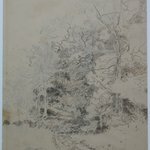 There is a video in the back of the show that shows Rodin's process, if you are interested! Rodin died in 1917 at the age of 77. 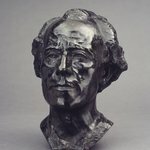 If Rodin sculpted in plaster, how does it then get "cast" in bronze? 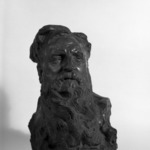 Rodin actually sculpted first in clay, then cast the work in plaster, and then in bronze. The casting process involves making a mold of the original sculpture, then removing the clay (destroying the original sculpture) and filling in the remaining cavity with plaster. A plaster replica of the original sculpture is the result. Bronze is cast in very much the same way, making a further mold via a method called the sand casting method from the plaster version. 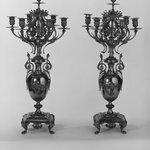 With plaster, multiple molds can be made rather than just one, and the bronze replicas can be made over and over, filling in the cavity in the mold with molten bronze to create each replica. I'm debating in my head the implication that Rodin was really the first sculptor to move away from "allegiance to the classical formula...[that] had drained much sculpture of vitality" and to reject "static forms and lifeless exhortations." 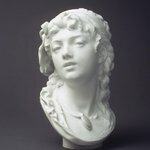 What about Bernini, several centuries back? 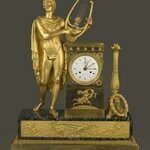 His sculptures are famous for their depiction of dramatic, sweeping movement that became hallmarks of the Baroque period. So are we supposed to consider him the first sculptor of just *his* generation, because we can't really consider Bernini "modern" at all? Or is this claim about Rodin true because his subject matter truly is completely separated from any classical myth or Biblical incident, and it's more about the human form as it exists unto itself than it is a story? Or is it because he was focusing on the tension and movement of the body using bronze instead of marble, and that was the main departure from the norm at that time? That is certainly a debatable subject! One factor is tied into "modernity" as you suggested. Rodin's work broke from the immediately previous tradition and led to an immediate shift in the field of sculpture. 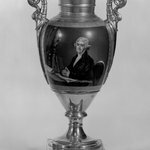 The use of marble vs. bronze was not a factor. 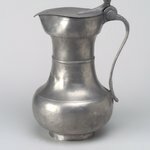 Both were used before Rodin and Rodin himself worked in both media. The differences in intention between Bernini's storytelling and Rodin's experimentation with the body itself is also a key fact. Plus Bernini was looking to Hellenistic precedents whereas Rodin was intentionally trying to create something new and never seen before. 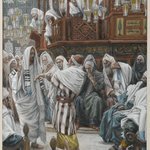 Both artists did depict Classical/Biblical subjects and portraits. That makes sense, thank you! 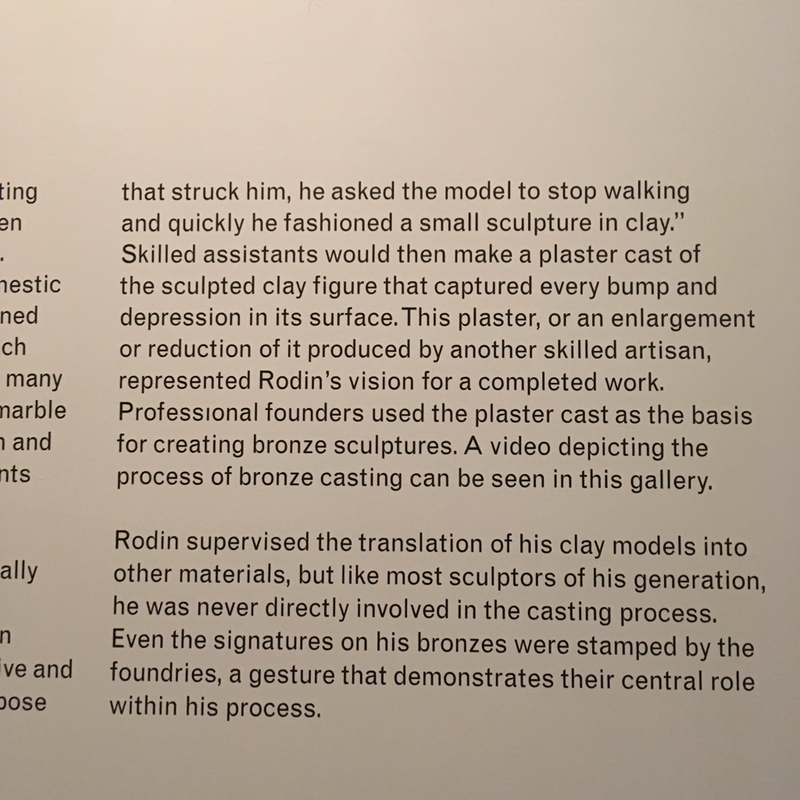 I didn't know that much about Rodin's work before so that all is good to know; I was basing my impression of his devotion to bronze just on this exhibit but it makes sense of course that he would have worked with marble as well. 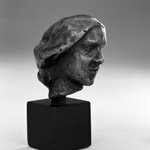 The bronzes, as you might imagine, are much easier to come by because they can be cast over and over again, so I can see how that would happen! 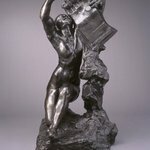 How did Rodin make these sculptures? Did he make casts and then pour bronze in? Or is it carved like stone? You're first guess is right! 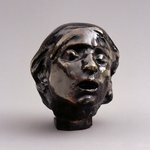 The bronzes you see in the gallery were cast in molds which were themselves made from clay models that Rodin sculpted. There is a short video in the exhibition that helps to explain this many-stepped process! If you look closely at a few of the larger works you can even see seams where the mold came together. We just watched the video of how Rodin made his sculptures, and we don't understand why the wax step in the casting process is necessary. The wax step is important to creating a hollow piece of bronze in the end. Especially with the larger sculptures, if they weren't hollow they would not cool evenly and be unmanageably heavy. The wax acts as an easily removable placeholder while the caster is creating the mold's core to be used in the final bronze casting process. Ok! That makes sense. One more question: why did they need to shape/correct the wax once it had been set, if it was going to melt away and had no effect on the actual shape of the cast/mould into which the bronze would be set? Sometimes, in the wax casting process, the hollow wax copy is removed from the mold and then dipped into another material which when heated creates a ceramic shell, while the wax melts away. 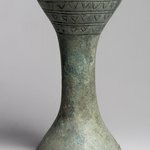 This means that the wax copy must be perfect as it is what will create the space for the bronze to fill in the ceramic shell. It is dressed to hide imperfections and a heated tool is sometimes used to remove the lines where the pieces of the mold come together. You want the wax to look as much like the finished piece as possible. Ah, that's what we missed, now it all makes sense. Incredibly interesting, thank you so much for your help! Learning lots today! The exhibit talks about how many different sculptors and specialists worked for him, who he directed in the making of his works. 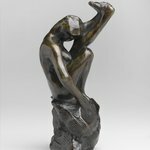 What stages in the process was Rodin most involved with personally? I supposed I would say that he was most involved in the sculpting in clay. That said he did continue to oversee the whole process. I don't think there was a defined point where he "handed it off." 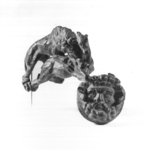 The actual act of casting in bronze is a very technical process that required the expertise of a foundry. I’m wondering if you could explain the casting process? 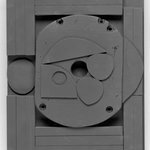 First, Rodin sculpts the work in clay and then a plaster mold is made in a heat resistant material, from the clay model. Then, the mold is filled with molten bronze. 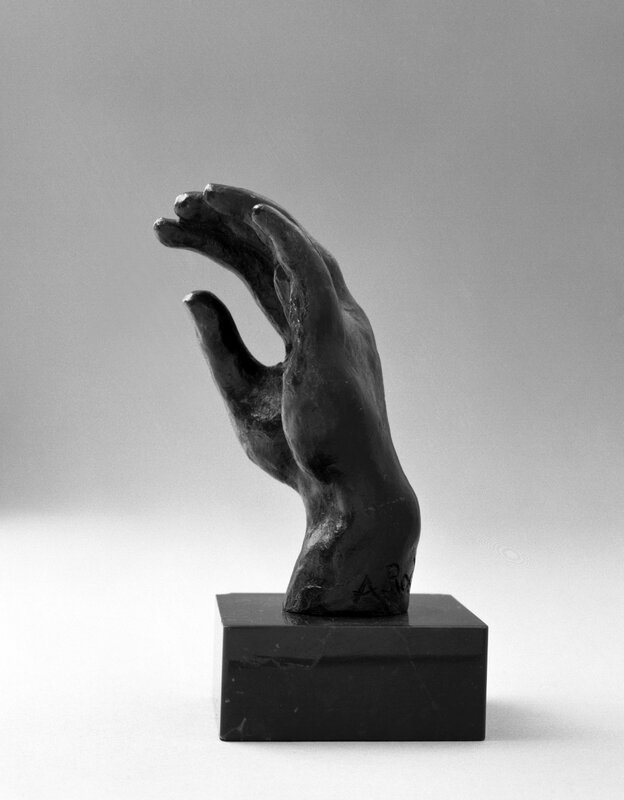 Rodin's favored method of casting was the lost wax method, which allowed for the creation of hollow sculptures. 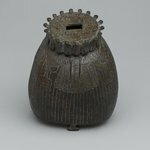 It was important for large bronze works to be hollow so that they would cool evenly and not be as heavy in the end. In this method, wax is poured into the mold to create a sort of lining. Then a clay-like material is poured into the mold and then entire thing is heated. Heating causes the wax to melt away and then the molten bronze is poured in to take its place. There is a video in the exhibition which shows the process. It's a bit easier to understand with visual aids. Rodin was born in Paris in 1840. He lived in Paris much of his life. He left many sculptures and all of his molds to the French government upon his death and a Musee Rodin was opened just outside of the city. 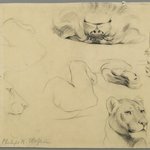 What is the material used in the Rodin exhibit? Rodin worked primarily in bronze, which is what you see in the exhibition here. There are also examples of ancient works in stone like those Rodin would have looked to for inspiration. 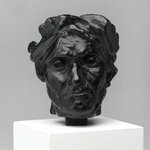 Why are some of the sculptures in the Rodin exhibit in clear boxes and some not? 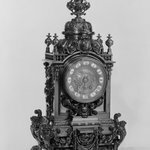 Some of the objects might be more susceptible to air and temperature given their state of conservation. And while visitors are not supposed to touch any of the objects, adding a case is especially helpful as an added layer of protection! Of course, it's easier to place smaller objects in a case than it is some of the larger busts and full body sculptures. Tell me about Rodin please. Hi there! Rodin was a sculptor with a unique way of working and prolific career, who lived from 1840 to 1917. 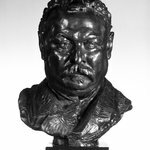 He sculpted first in clay, and often parts of the body, which he would then study and recombine to create works that could be cast in plaster and then in bronze. 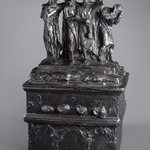 Rodin was inspired in part by fragmented classical sculpture, and created several well known monumental works, including the Burghers of Calais and The Gates of Hell. 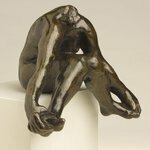 Rodin is known for the emotion and weight he added to his sculpted forms, during a time when polished and impersonal sculpture was the norm. Notice, for instance, the large, expressive hands on the sculpture of Pierre de Wiessent that greeted you on the way in. SIGNATURE Back of hand at wrist: "A. Rodin"